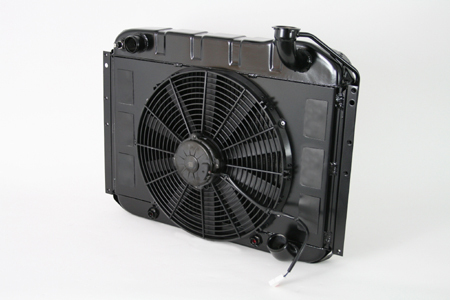 This package includes our "Direct Fit" aluminum radiator, full face aluminum shroud with (6) rubber check valves, and a high performance 16" spal Fan (2360 cfm 21.6 amps) Due to the fan motor size, there may be interference with the factory suspension on 1958-60 model Corvettes. This package should only be used on cars with alternator conversions. The kit includes one wire harness and temperature switch.